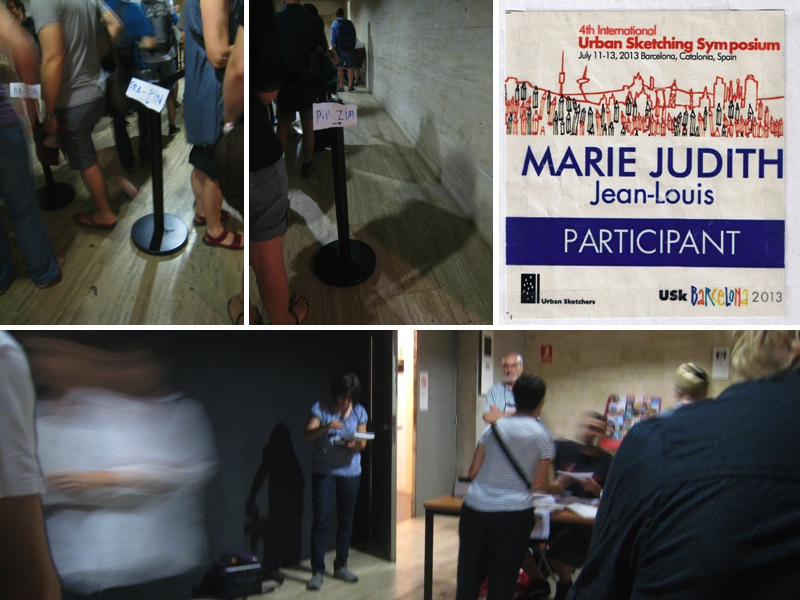 The day started with registration at the CCCB. The organizers had arranged for people to line up according to their last names to get their badges and their bag of goodies. 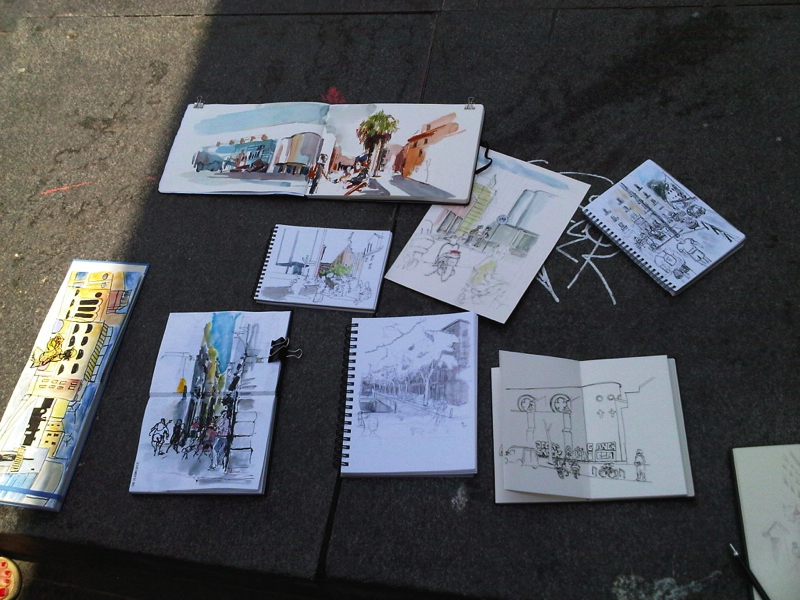 People were already sketching the event as it was happening. I'm amazed at how easily some sketchers can set up their watercolors and just get to it. 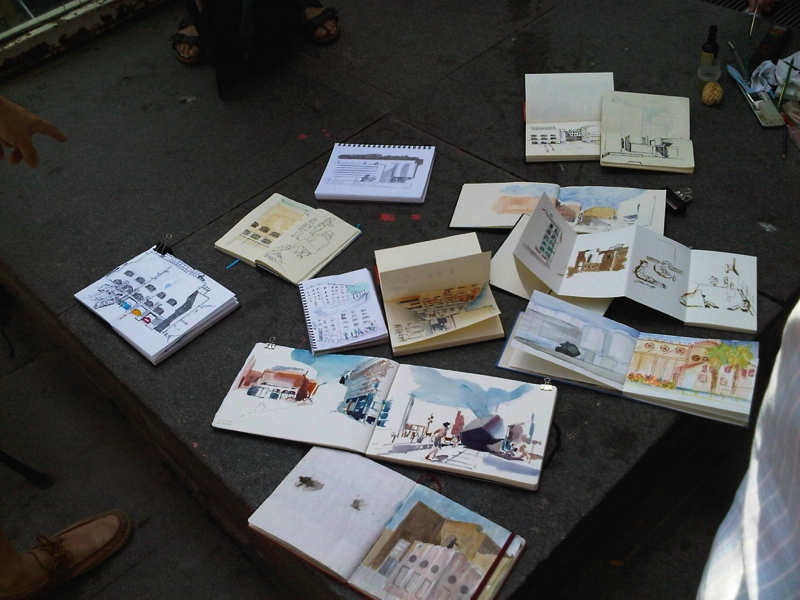 You can see Suhita Shirodkar above who was one of the correspondents along with Lapin for the event, sketching away. It was very inspiring to see how quickly and effectively they were able to depict what was happening around them. 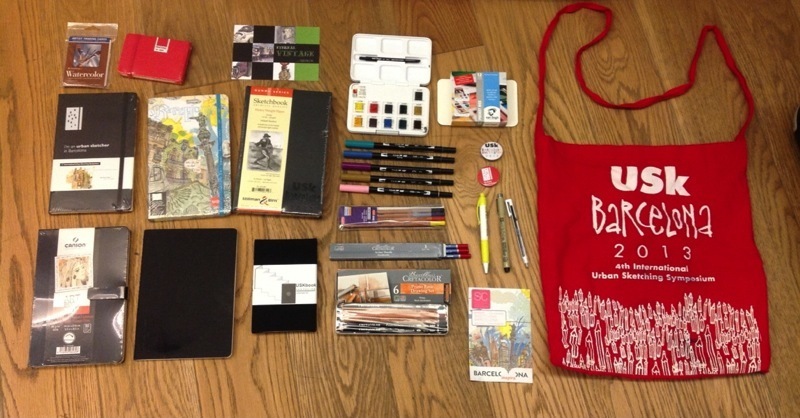 We each got a bag of goodies : sketchbook, pens, pencils, markers, watercolors, etc. I must say, I was very impressed with the amount of stuff we received from the sponsors. I already started to play with some of them since I got back home. Then we had a morning panel with the organizers to welcome us to the symposium. I believe all the instructors were also on stage. 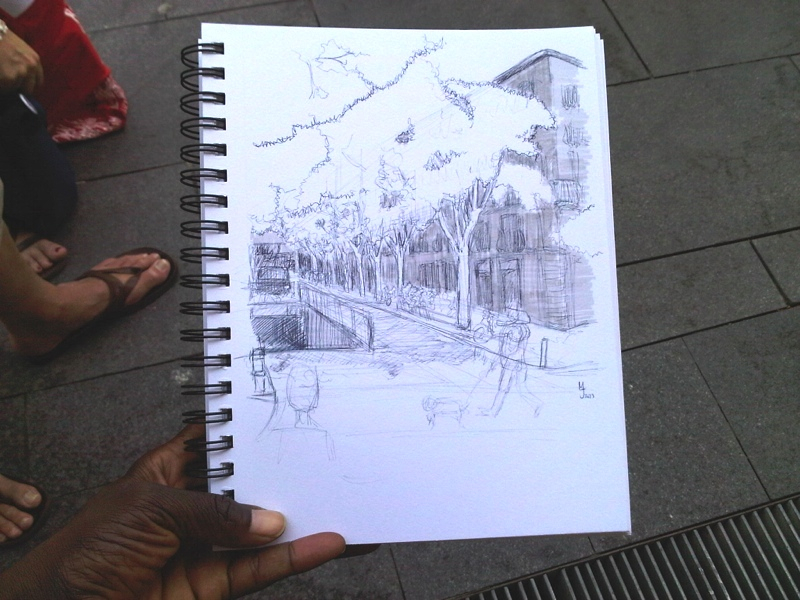 Many people were sketching as well, so I decided to do a quick sketch as well with a simple pen. The first workshop I took was focused on composition. Using the architecture as a stage and moving elements (i.e. people, cars, pets, etc) as the actors. I thought it was a really neat concept to be able to tell a story with the sketches like that. As an exercise we had to draw the same scene twice : One time emphasizing on the stage and the other time, emphasizing the actors. Above are my results. The first thing I noticed is that people draw and paint really fast. I tend to be a little slow so I didn't even bother with colors. I just added some shade afterwards. A lot of seasoned urban sketcher use watercolors and since I hadn't really used that medium before, I decided to stick to the basics : pen and brush pens. 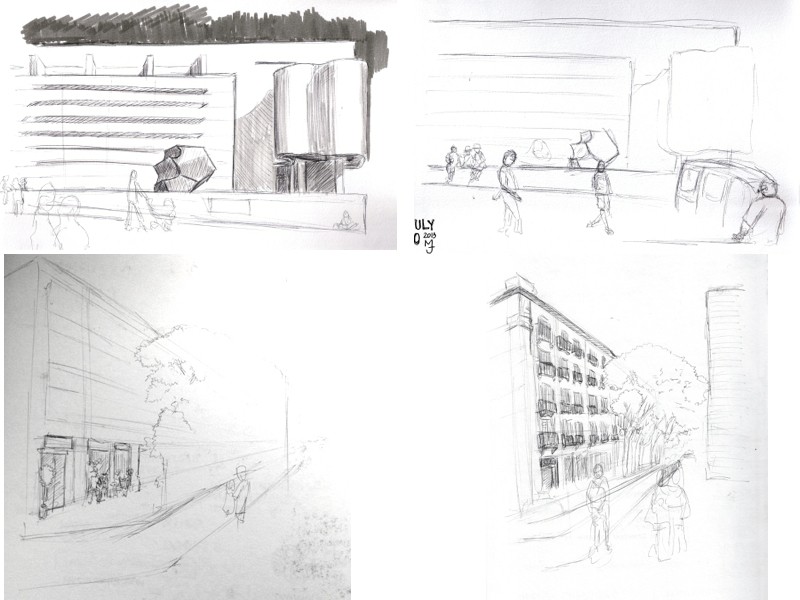 I wasn't super happy with the first four drawings, but I took in a lot of great information. I realized quickly that for me this was going to be about learning new techniques and philosophy. I love that after each task we all came together to share our drawings. There were some great artists in my group. Notice how finished the watercolor drawings look. 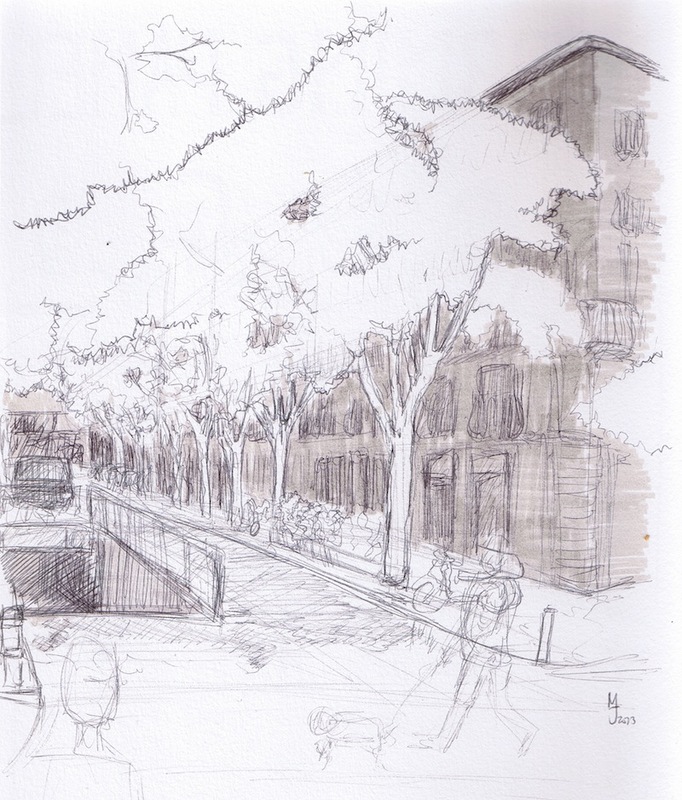 They are not as precise as the pen drawing but you get a real sense of the place very effectively. I was starting to understand why watercolors seems to be the medium of choice with urban sketchers. We had a final task where we put everything we learned together in one final drawing. Luis gave me some great tips about how to give my drawing more depth and layer it by suggesting what to emphasize and what to de-emphasize with simple shading. This was my result. It's SO much better than the first four drawings and I didn't even use colors. The presenters showed us the programs they used to create digital sketches as well their tools and methods. It's too bad it was a demo as opposed to a workshop. It would have been interesting to try it out but there just wasn't enough time. Still I can see the benefits of using a tablet for some digital sketching and what tool work better then others. The most important thing I took away from this is that I need to use a better stylus to get better results. Unfortunately I missed this class :( . I was at the right place but at the wrong time. Probably the jet lag thing was getting to me. But I had a great first day nonetheless and met great people on the first day, some of which I was able to l keep in touch with as well. Super résumé, une bonne bouffée d'air catalan !